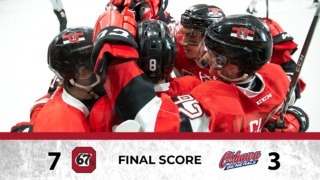 Despite a 7-5 loss to the London Knights, the Ottawa 67’s had something to cheer about Sunday afternoon. They clinched a playoff spot in the OHL’s eastern conference after the Peterborough Petes fell 4-2 in Niagara. 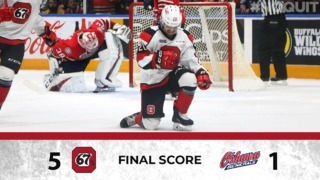 Ottawa needed one point to get the job done themselves, but they couldn’t overcome an early deficit against one of the OHL’s top organizations and dropped a high-scoring affair at the Arena at TD Place. The Knights took advantage of some early chances and opened up a 4-1 lead after the first period, but Ottawa found their way back into the hockey game. After outshooting London 16-11 in the first period, the Barber Poles continued to dominate the shot clock in the second. They had 15 shots to London’s six, which eventually led to the 67’s getting back into the game. Mitchell Hoelscher made it a two-goal game at 5:39 of the second, and then the 67’s came flying out of the gate in the third period. 19 seconds in, Travis Barron’s 17th of the season put the 67’s down 4-3. The furious third period pace continued for the home side when Austen Keating tied the game at 3:58, completing another impressive three-goal comeback for Ottawa against one of the best teams in the OHL. London would pull away with two late goals, however, and Alex Formenton’s dazzling move at 13:56 of the third would stand as the game winner. Seva Losev’s first period 67’s goal was the second of his OHL career, and his first since the opening game of the season against Barrie. 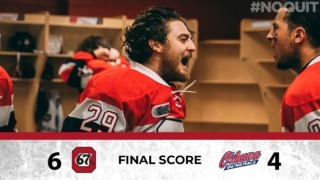 The 67’s have now come back from a three-goal deficit to tie or win on seven different occasions in 2018. The most recent occurrence was during a 9-6 loss to Owen Sound on February 17. Ottawa pulled Olivier Tremblay after the first period; he allowed four goals on 11 shots in the opening frame. Cedrick Andree came on in relief, making 17 saves.